Or imagine if I tried to explain away an abortion-clinic bombing by noting that far more people die in swimming-pool accidents. I’m not so sure the gang at Vox would nod appreciatively. Rather, my hunch is that the outrage would be deafening — and rightly so. Needless to say, human beings do respond when they encounter resistance, and that makes motivated attacks like London or Tehran very different. 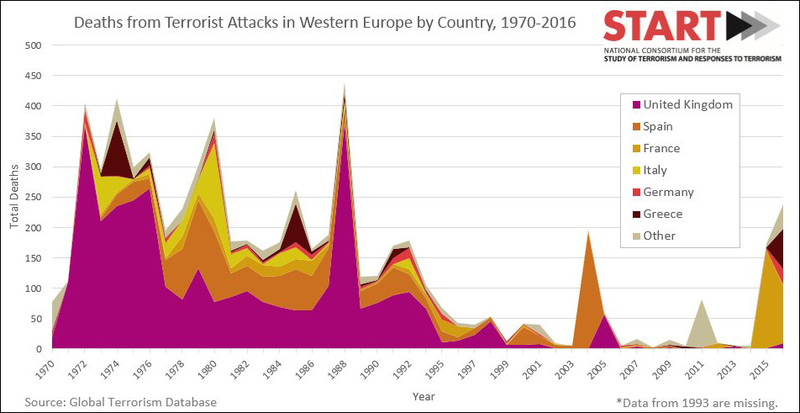 Without continual vigilance, improved tactics, and possibly an ever-increasing fight,2 terrorist attacks would grow considerably over time. In addition, it’s simply human nature to fear attacks from other human beings far more than the possibility of an impersonal mishap. That’s why homicide investigations are a lot more thorough than bathtub accident investigations. Now, having said all that, I have one question: Just who are all these liberals comparing terrorism to bathtub slip-and-falls? This was actually fairly common a number of years ago, but I’ve seen less and less of it recently—and Goldberg doesn’t cite any examples following the London killings. Neither does Michael Brendan Dougherty, who Goldberg links to. He mentions only a couple of non-liberals, both of whom have written items about the rarity of terrorist attacks in the past. I don’t doubt that you can still find examples of liberals making the bathtub argument. Social media is vast, after all. But I really don’t think it’s a very common trope anymore. Good riddance to it. 1Note that “relative” is doing a lot of heavy lifting here. Even with cars and bathtubs, we have big fights about just how much regulation is appropriate and how many lives it’s likely to save. 2Or maybe not. There are plenty of liberals who believe that we’re fighting terrorism the wrong way, but that’s very different from suggesting it’s no big deal compared to traffic accidents.